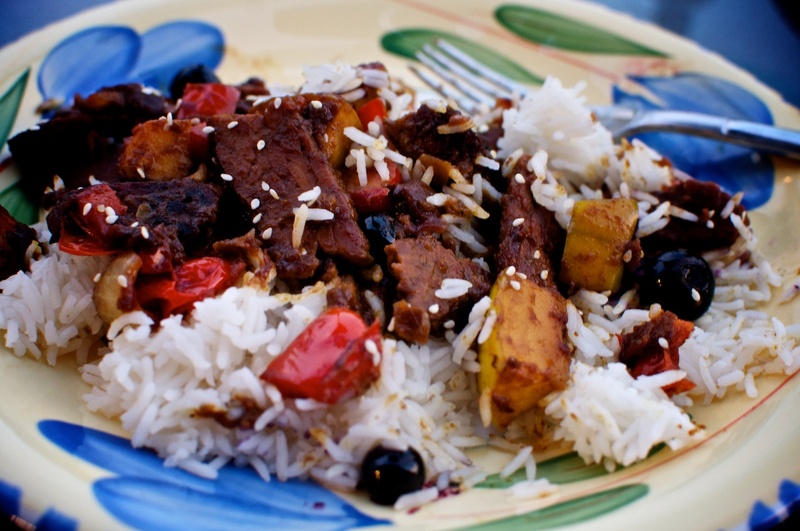 This dish turned out to have a wonderful sweet and savory balance – between the apples and blueberries, and the smokey maple bacon tempeh and curry. I’ve never tossed blueberries into a stirfry before, but I’ll definitely try it again! In a skillet, prepare the tempeh as instructed by the packaging. Set aside. In the pan that you cooked the tempeh in, heat 1-2 tablespoons of olive oil over medium to medium high heat. Add the onion and red pepper and saute until onion is nearly transparent, adding splashes of apple cider vinegar along the way as the pan dries out. Add a bit more oil to the pan, then stir in the apples and tomatoes. If it seems dry you can add more oil or apple cider vinegar. Saute. When apples start to brown, stir half of the curry mix into the pan along with the blueberries, aniseed, and caraway. Saute 2-3 minutes, or until curry is mostly absorbed. Next, add 2 tablespoons of your jam or chutney and half of the remaining curry mix. Stir and allow to mostly absorb. Repeat with 1-2 more tablespoons of jam and the remaining curry mix. Once curry is mostly absorbed, but still moist, divide the curry onto plates or bowls and sprinkle with sesame seeds. Posted June 9, 2013 at 6:04 pm in Cooking, Recipes and tagged 2013, Cooking, food, improv. Comments RSS. Post a comment.